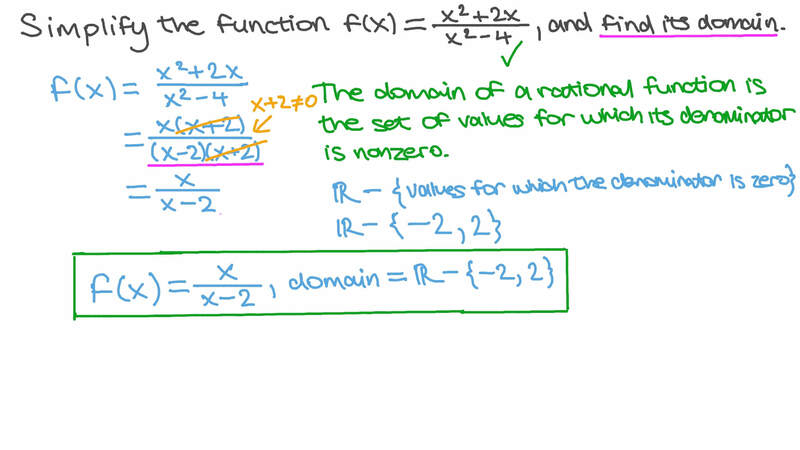 In this lesson, we will learn how to simplify rational functions and how to find their domains. Simplify the function , and find its domain. Simplify the function 𝑛 ( 𝑥 ) = 𝑥 + 1 𝑥 + 3 𝑥 + 2 2 and find its domain. 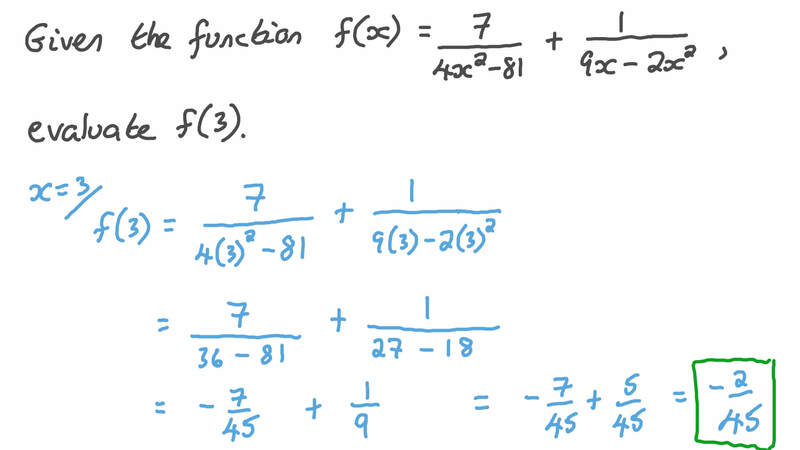 Given the function 𝑓 ( 𝑥 ) = 7 4 𝑥 − 8 1 + 1 9 𝑥 − 2 𝑥 2 2 , evaluate 𝑓 ( 3 ) . Simplify the function 𝑓 ( 𝑥 ) = 7 𝑥 + 4 3 𝑥 + 6 7 𝑥 + 5 0 𝑥 + 7 2 2 , and find its domain. Given that 𝑛 ( 𝑥 ) = 𝑥 − 5 𝑥 + 5 1 and 𝑛 ( 𝑥 ) = 𝑥 − 5 𝑥 𝑥 + 5 𝑥 2 2 2 , find the largest set on which the functions 𝑛 1 and 𝑛 2 are equal. Given the functions 𝑛 ( 𝑥 ) = 𝑥 𝑥 − 1 0 𝑥 1 2 and 𝑛 ( 𝑥 ) = 1 𝑥 − 1 0 2 , what is the set of values on which 𝑛 = 𝑛 1 2 ? Which of the following statements describes when two functions 𝑛 1 and 𝑛 2 are equal? Simplify the function 𝑛 ( 𝑥 ) = 𝑥 + 1 ( 𝑥 + 1 ) ( 𝑥 − 3 ) 3 and find its domain. Simplify the function 𝑓 ( 𝑥 ) = 𝑥 − 8 1 𝑥 + 7 2 9 2 3 and find its domain. Simplify the function 𝑛 ( 𝑥 ) = 𝑥 − 1 2 5 𝑥 + 5 𝑥 + 2 5 6 4 2 , and find its domain. Simplify the function 𝑓 ( 𝑥 ) = 𝑥 + 𝑥 − 8 0 𝑥 − 4 3 2 , and find its domain. Simplify the function 𝑛 ( 𝑥 ) = 𝑥 + 𝑥 − 2 0 𝑥 + 5 𝑥 − 1 6 𝑥 − 8 0 2 3 2 , and find its domain. Given that the algebraic fraction 𝑛 ( 𝑥 ) = 8 𝑥 ( 𝑥 + 4 ) 𝑥 + 𝑎 simplifies to 𝑛 ( 𝑥 ) = 8 𝑥 , what is the value of 𝑎 ? Given that 𝑛 ( 𝑥 ) = 𝑥 + 6 4 𝑥 − 1 6 1 , 𝑛 ( 𝑥 ) = 4 𝑥 + 2 5 6 𝑥 − 1 6 2 , and 𝑛 ( 𝑥 ) = 𝑛 ( 𝑥 ) ÷ 𝑛 ( 𝑥 ) 1 2 , find 𝑛 ( − 4 ) if possible. Given that 𝑛 ( 𝑥 ) = 𝑥 + 1 2 𝑥 + 3 6 𝑥 − 𝑎 2 2 simplifies to 𝑛 ( 𝑥 ) = 𝑥 + 6 𝑥 − 6 , what is the value of 𝑎 ? Given that the functions 𝑛 ( 𝑥 ) = 8 𝑥 𝑥 + 𝑐 1 and 𝑛 ( 𝑥 ) = 8 𝑥 + 𝑑 𝑥 𝑥 + 𝑐 𝑥 + 5 𝑥 − 1 5 2 3 3 2 are equal, what are the values of 𝑐 and 𝑑 ? 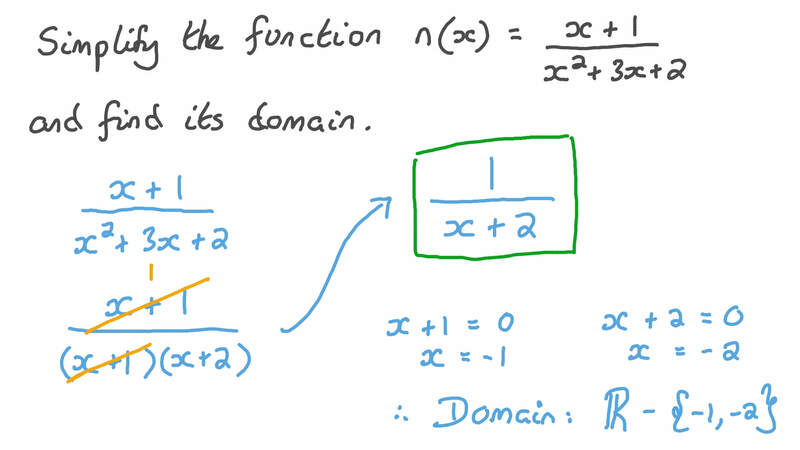 Simplify the function and find its domain. Given that 𝑛 ( 𝑥 ) = 𝑥 − 𝑎 𝑥 − 3 2 𝑥 + 𝑥 − 7 2 2 2 , and the multiplicative inverse of 𝑛 is 𝑥 + 9 𝑥 + 4 , what is the value of 𝑎 ? Given the functions 𝑝 ( 𝑥 ) = 3 𝑥 − 3 0 𝑥 ( 𝑥 + 1 0 ) ( 𝑥 − 1 0 ) 2 and 𝑞 ( 𝑥 ) = 3 𝑥 𝑥 + 1 0 , what is the set of values on which 𝑝 = 𝑞 ? Given that the multiplicative inverse of the function 𝑛 ( 𝑥 ) = 2 𝑥 + 1 0 𝑥 𝑥 + 1 4 𝑥 + 𝑎 2 2 is 𝑥 + 9 2 𝑥 , find the value of 𝑎 . Determine the domain of the function 𝑛 ( 𝑥 ) = 𝑥 − 6 4 8 𝑥 + 7 𝑥 ÷ 9 𝑥 − 1 1 7 𝑥 + 3 6 0 6 4 𝑥 − 4 9 2 2 2 2 . Simplify the function 𝑓 ( 𝑥 ) = 𝑥 − 4 𝑥 − 𝑥 − 2 2 2 and find its domain.